At Country Grove, our goal is to educate our clients so they can be responsible, knowledgeable, and successful pet owners, enhancing the human-pet bond for families. We strive to provide progressive veterinary medicine to our community with compassionate, high quality pet care services, in a healing, comfortable environment. 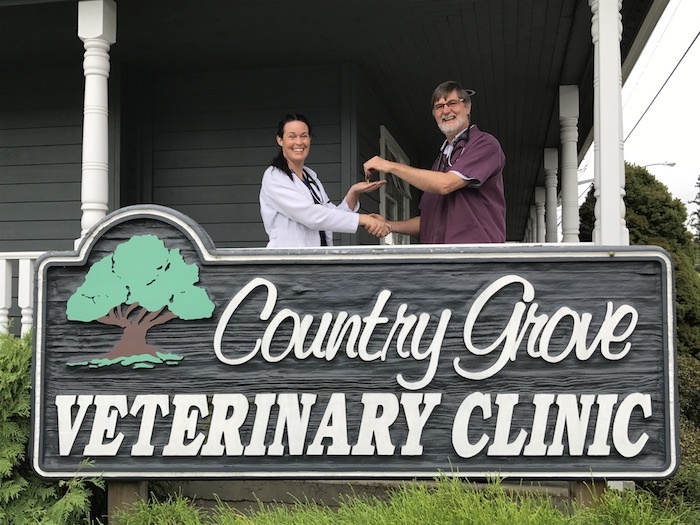 Dr. Gordon Carnes and his wife Jean, purchased the vacant lot where the clinic stands in 1986 with the intention of building a stand alone veterinary clinic that would provide the future clients and pets with a “homey country atmosphere”. The building was designed to pay tribute to Aldergrove’s past heritage, while providing natural light to most rooms and allowing for future expansion. The reception area was furnished with antiques acquired that fulfilled the display and storage requirements to keep the desired atmosphere. From the numerous comments over the years, the goal was achieved. The rest of the clinic, including the treatment area, surgery suite, in-house lab, radiology room, kennels rooms were designed for efficiency and the ability to adapt for future needs. After 30 years of use, and all the changes in Aldergrove, and in veterinary medicine, the building has stood the test of time. Hello! My name is Dr. Jessica Wolfe. As the new owner of Country Grove Veterinary Clinic, I am excited and feel it is a privilege to be taking over from Dr. Carnes. He has created a warm and welcoming hospital for families and their pets. I hope to continue the success of Country Grove, to lead it with passion and reach new levels. I look forward to meeting his clients and the patients. Thank you for coming in to meet with me and entrusting me with your pet’s health care.